Our very first Mid–Summer Treat was kindly held by our Hospice volunteer Sandra Fairclough and her husband Colin last month. Sandra has been a dedicated volunteer for over six years and supports Wirral Hospice St John’s in many ways including working on the Fundraising reception, helping at many fundraising events, making and selling greetings cards and opening her beautiful garden in Heswall (Inglewood) as part of the National Gardens Scheme to raise funds. All proceeds from these wonderful activities go to the Hospice. For her Mid-Summer Treat, Sandra’s family and friends enjoyed a delicious buffet lunch of sandwiches and homemade cakes and took part in a raffle with some lovely prizes. 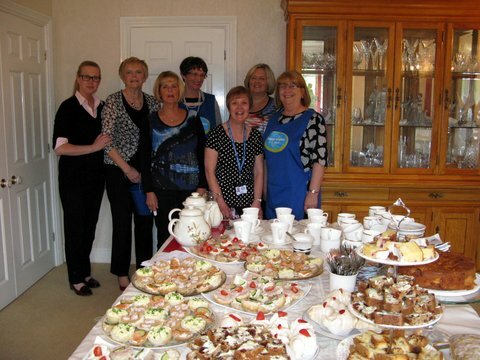 Everyone at the Hospice were delighted to receive the fantastic donation of £522 proceeds from the lunch. If you would like to help the Hospice by holding your own small event for your own family and friends we would love to hear from you. This can be anything from a BBQ to an afternoon tea. We offer lots of help, advice and support such as creating posters for you and an invitation, plus promote your event on our facebook and twitter feeds if you’d like us to, and all participants will receive a certificate of thanks following their event. To find out more or to sign up, please contact Hayley Gough at hayley@wirralhospice.org or call 0151 343 0778. If you would like to help Sandra to raise even more funds please visit her lovely garden on 12th or 13th July, 1.30-5pm – entrance fee is £4 per adult, children free. Delicious homemade refreshments, like the ones in the photo, will be available to buy. Sandra is truly one of our Hospice Heroes, thank you so much for everything you do!